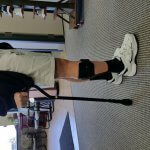 Footwear plays a very important role in the functionality of any orthotic or brace. If the shoe is not stable, it makes it very difficult for the orthotic to provide support and puts additional pressure on the orthotic because it now has to try to stabilize itself in the shoe. We often use the analogy that if you don’t wear proper footwear with your orthotic treatment, it is like putting poor quality tires on a sports car – you compromise the performance. To make sure your orthotic or brace gets the best support, we have outlined a few tips to keep in mind when looking to purchase shoes. 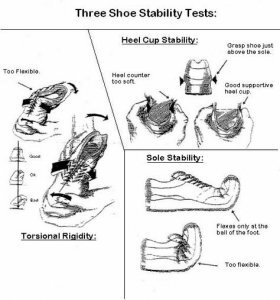 Torsional Stability: When holding a shoe with the heel in one hand and toe box in the other, try to twist the shoe. You shouldn’t be able to ring the shoe out like a rag. Sole Stability: When holding a shoe with heel in one hand and toe box in the other, try to bend the shoe in half. The shoe should only bend at the toe. If it bends in half, then it is too flexible. Heel Counter/Cup Stability: When holding the shoe at the heel, try to squeeze it and push it in. You shouldn’t be able to push down the heel counter of the shoe or squeeze it. When looking for a pair of running shoes to work with your orthotic or brace, consider what kind of activities you will be performing. Motion control runner: A shoe meets the above criteria very closely, with a dual density midsole that is more substantial or aggressive than a stability shoe, often containing a hard plastic roll bar. We find the majority of people wearing orthotics would be best suited with a neutral supportive runner, allowing the orthotic to provide the necessary control. With that said, there are certainly cases where orthotics can be worn with stability or motion-control shoes, but we suggest you consult a health service provide to be sure. When picking a shoe, it is key to take your orthotics with you and try on a few different models and select the pair that is most comfortable. We have put together a list of suggestions based on different types of support (see below). If you have any questions or concerns when it comes to selecting the footwear for your orthotic or brace, contact Applied Biomechanics today!